Foodista | IFBC SaMo Chef & Keynote Speaker Announced: Michael Moore! We are delighted to have Chef Michael Moore prepare the meal and speak at the Saturday evening dinner at IFBC in Santa Monica! 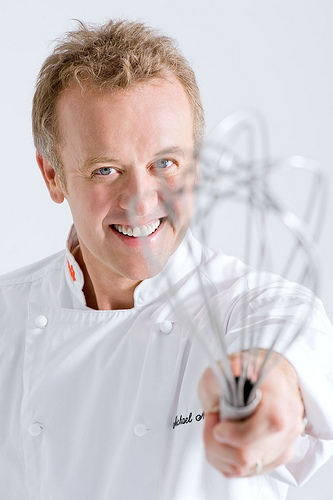 Michael Moore is one of Australia’s most experienced and respected chefs. From humble beginnings in the UK, Michael Moore started out in some of London’s best restaurants. Now 26 years into a career spanning two continents, Michael has owned and managed numerous top restaurants in both London and Sydney including The Ritz Hotel London, Kables, Craigend, The Sydney Opera House, The Bluebird London by Sir Terrence Conran, Pruniers, Bonne Femme and Wildfire. He is the chef / owner of Sydney’s most iconic restaurant, the Summit and has recently brought a taste of New York to Sydney with the opening of Reuben & Moore (sandwich bar & grill) in the new Westfield Sydney. Michael has earned critical appraise on both sides of the globe, as well as a number of coveted chefs’ hats from The Sydney Morning Herald’s Good Food Guide. For the past 8 years Michael has been entertaining Australian audiences with his cooking skills - appearing on tv shows such as Mornings with Kerri-Anne on Channel Nine, The Today Show, Domestic Blitz, Sunrise, The Morning Show, Sydney Weekender and The Boss Is Coming To Dinner. Michael has had a long standing relationship as guest co-host for one of Australia’s most popular cooking show Fresh on Channel Nine.